The contradictions between common representations of the Palestinian population in predominantly Western media and actual real life encounters as visitors to the country usually experience them could not be greater. Images of angry mobs burning US and Israeli flags, of masked fighters roaming the streets, shooting their guns into the air and screaming "Allahu akbar" (Arabic: "Allah is the greatest") are amongst the most common depictions and obviously instill a sentiment of fear. This is not to say that these scenes do not ever happen in Palestine, however, as a visitor, you are most likely to be attacked by warmth and unconditional care, rather than by gunshots or other forms of hostility. In fact, Palestinian hospitality is famous, if not notorious. Walking through the streets of a village, town or even a city, a stranger is very likely to be greeted by people sitting in front of their shops or houses and invited in with a "tfaddaloo" (Arabic: "please", in the sense of "come in" or “have a seat”). It is said that only after the third polite decline of the offer, the host to be will give in and stop repeating her/his invitation. If the stranger will accept, however, the "tfaddaloo" will be followed by an "ahlan wa sahlan" (Arabic: "welcome") which in turn will be precede the notorious "qahwe willa shay?" (Arabic: "coffee or tea?"). At this point of the interaction you should be aware that you gave yourself into the hands of your host and that by now it will be difficult to decline or to leave. 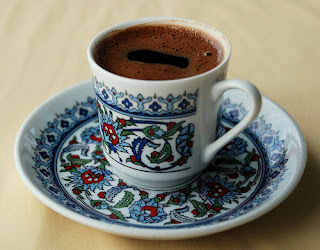 The coffee that is being offered to you is most likely Arabic coffee, spiced with cardamom. Palestinians tend to drink it “saada”, meaning without sugar, but commonly offer their foreign visitors a slightly sweetened version. The tea usually drunk in Palestine, in turn, is very sugary and is being complemented with tasty “marramiyye” (Arabic: “sage”). So if you embark on a West Bank tour that includes visiting local homes, get ready for a very sweet and stimulative (in the sense of full of caffeine) experience. This being said, however, doesn't mean that you have to accept each and everything that is being offered to you. Palestinian hospitality is a very generous one, and even families with a very low income, especially in the villages or the refugee camps, will offer you what they have, even if it constitutes a great expenditure to them. This obviously makes it much harder to decline, but me for instance, I'm vegan and not a very flexible one and I successfully do turn down the frequent offers of chicken, which commonly accompanies the very popular and extremely tasty rice dish of “Maqluba”, which in Arabic means “upside down” and refers to the way this meal is being prepared. 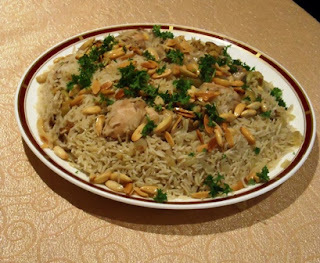 So when I say that Palestinian hospitality is notorious, I don't mean to say that people will not accept or understand a decline, especially if it is based on allergies, vegetarianism or other special diets, or that they will be offended if you turn down their invitation to spend the night at their home, an offer that may even come from complete strangers sometimes. All in all, it is safe to say that a Palestine tour will be incomplete without the experiencing of the people's infinite warmth and care expressed through their hospitality and whoever has had the chance to spend some more time among the people and in their homes, especially in the villages, will surely be able to relate to what I'm saying.